Description: The Carnival Stacker is a stacking toy with an added kick! The base is yellow with a clown's face. Stack the four rings onto the base, the press the clown's hat for a "boing" sound and to sent the rings flying off the base. Designed for children ages 12 to 36 months old. 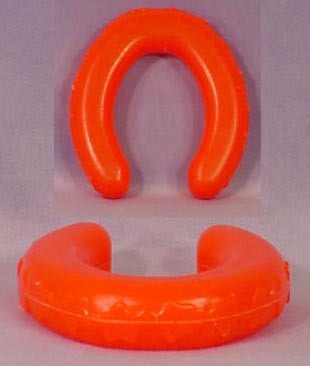 FPT19023 - Round yellow plastic base with molded clown feet on the bottom and an upright oval-shaped "clown" center. The center has a paper lithograph picture on one side of a smiling clown's face and a crying clown's face on the other side. 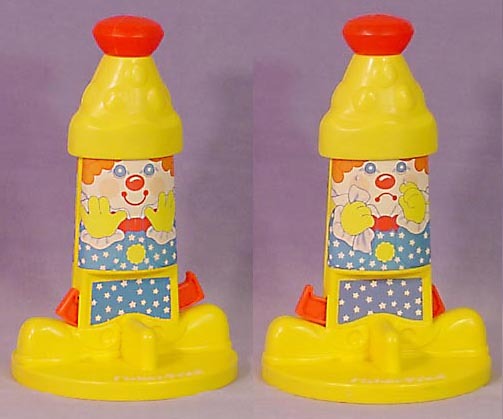 The top has a yellow plastic cone-shaped hat with a round red top. Press the hat for a "boing" sound and make red pegs by the shoes press against the attached accessory rings to send them flying. Measures 9-3/4" tall with a 6-1/4" diameter base. 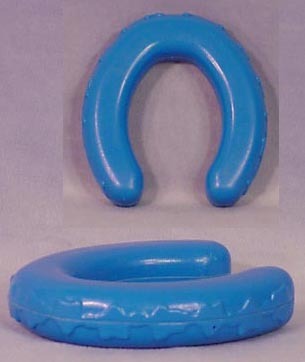 FPT19024 - Blue horseshoe plastic ring with molded star designed on the outer edge. Measures 4-3/4" long, 4-3/8" wide, 1" thick. 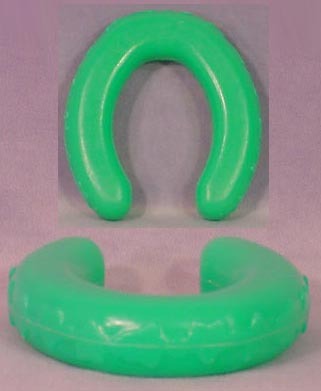 FPT19025 - Green horseshoe plastic ring with molded star designed on the outer edge. Measures 4-3/4" long, 4-3/8" wide, 1" thick. FPT19026 - Red horseshoe plastic ring with molded star designed on the outer edge. Measures 4-3/4" long, 4-3/8" wide, 1" thick. 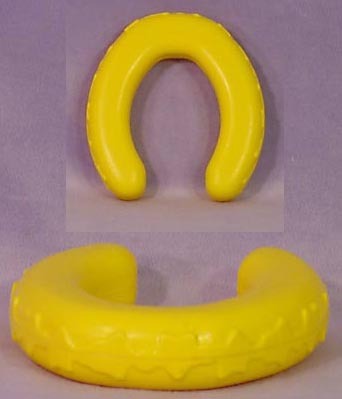 FPT19027 - Yellow horseshoe plastic ring with molded star designed on the outer edge. Measures 4-3/4" long, 4-3/8" wide, 1" thick. This set was sold in a 6-1/4" long, 6-1/4" high, 9-1/2" deep box. Click here for a complete list of Rock-A-Stacks and other ring toys.